Do you use laser scanning for fast data collection? But find point clouds too confusing? Looking for a fast and easy workflow? Want to start without training? The PointSense Family provides several tools for the management and processing of laser scan data within AutoCAD and supports the import of almost all currently available 3D laser scan data formats into AutoCAD. Common to all programs is the easy and quick management of the huge and bulky point clouds in AutoCAD. ​Intuitive tools tailored to the needs of the respective industries enable fast, secure and accurate modeling and analysing of the 3D laser scan data to CAD drawings, 3D models and plans. The software can be used anywhere measurement data needs to be extracted from laser scans. Measurements for window construction, interior fittings, interior design, etc. VirtuSurv is FARO 3D Software’s standalone software for working with highly visual laser scan data. The program supports the import, export and display of numerous structured scan data formats and has interfaces for Windows based programs as well as various CAD and BIM packages. This flexible platform makes the use of laser scans as easy as using a measuring tape. Take accurate measurements within seconds. VirtuSurv supports a completely digital, less error-prone workflow. Take your measurements in an easy to navigate photo-like scan view and send them directly into the Windows application of your choice. Fill in your forms, Excel sheets, databases or tables with distances or coordinates. Generate results in just three steps: Load the project. Connect to your Windows application. Measure. Click and measure your desired points within VirtuSurv and the design is simultaneously drawn into your CAD plan, BIM design. Find coordinates, distances and draw CAD objects without loading large and bulky point clouds into your CAD environment. Adapting VirtuSurv to your current workflow is fast and efficient. Write your own macros with CAD commands and make them easily available using hot keys. Take advantage of predefined and comfortable command strings. High resolution views make it possible for the user to navigate intuitively, recognize needed objects and easily survey them within the familiar photo-like view of the scans. Do you have scans of the same scene, but taken with different scanners in different formats? Combine them in a single VirtuSurv project and measure across the single scan boundaries. 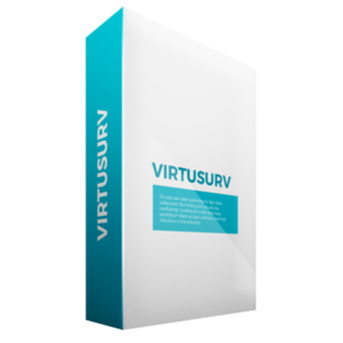 VirtuSurv provides macros which can control the actions of external programs from within the VirtuSurv interface. This considerably speeds up the evaluation of scan data and prevents you from switching between VirtuSurv and the target application. As an experienced user, customize the macros at your will and create new macros in order to optimize your workflow. Surveyors traditionally using a total station and coded field books to generate a finished drawing upon import to their CAD package can now combine laser scanning with this familiar workflow. The ”Create Field Book” option within VirtuSurv supports this traditional procedure and reduces training to a minimum.